This is being written not as discouragement as much as a warning to amateurs that can easily get in over their heads. I wrote this editorial series three weeks ago, but hesitated to publish it, as I was not entirely pleased with its tone. An overly sensitive or defensive reader may misinterpret my honesty as arrogance, but I assure you this is not the case. Again, video is an extremely complex art and science (it’s both! ), and after nearly two decades of practice, even I’ve only managed to master a tiny subset of skills. The primary difference between doing video for yourself (and friends/family), and doing it as paid freelance work (or at a company), is that your opinion on quality does not matter. Nobody cares what you think looks or sounds good or “good enough”. The opinion of the client is the only one that matters. The client expects a certain level of quality — sometimes unrealistically so — and it’s going to be your job to provide it. Businesses that are open to the public will almost always attract clients of varied backgrounds. For example, in addition to consumers, I regularly deal with filmmakers on the west coast, studios on the east cost, and corporations and organizations all over the world. The work ranges from fun (competitive short films) to boring (corporate training videos). These clients have expectations of quality, and will be unrelenting if the work is not to their standards. Even those moms and dads with libraries of home movies have expectations — sometimes even more demanding than the business sector. To make matters worse, homemade family movies are in far worse condition. Managing customer expectations is just as important performing the work itself — and professionals need to address this in advance, not after the client is disappointed or angry (or both). This is where a deep knowledge of video, and a professional background in video, comes in very useful. You can explain why something is or is not possible. The experience you gain transferring your own home movies is often meaningless. Videos from customers almost never react the same way in the VCR or camera used for your own home/hobby videos. The entire workflow tends to be quite different. VCRs and cameras are complex analog equipment, with snake-like tape paths and spinning hardware that determine the precise location where signal data is recorded on a tape. Even the slightest variation in head alignment (between the VCR/camera that made the tape, and the one used to play it) can make your favorite player useless for playback. It may play with significantly degraded quality, or maybe not play it at all. Even something as non-obvious as tape particulate quality, and its interaction with certain head models, can affect the quality of playback. For these reasons, a professional video service needs not one deck, but many. And that quickly runs into thousands of dollars if you’re using quality equipment. A hobby setup will not be adequate. Professionals will come across tapes that have been “eaten” (feathered or crinkled), are shedding the oxide, have been subjected to smokers (tar buildup), and are infested with mold spores. Each of these poses a problem, both for you and for the customer. Here, for example, every tape is inspected thoroughly before I let them anywhere near the VCRs, VTRs or cameras. A VCR can easily be ruined by physically damaged media. Mold spores, for example, can ruin not just the deck, but will actually spread to other tapes and can destroy those, too! An amateur never really considers these sorts of issues. A professional has the common sense to turn away projects of this nature — or accept them only if they have workflows built for it. There are companies that exist solely to recover media that is damaged by mold, floods, mudslides, etc, and a smart videographer will give references to these services. When something goes wrong on a video hobby project – when, not if — at least the only one affected by it is yourself. You can take it as a learning experience, brush it off with an “oh well” attitude, and move on to the next one. If you screw up a client project, “oh well” isn’t going to cut it. If you do a bad job with a professional project, your business is over (and rightly so). If you let an old consumer VCR eat somebody’s wedding tape, you’ll likely find yourself sued. There are a lot of naive freelancers and shameful “businesses” out there who let their video hardware degrade without maintenance. Most of them simply don’t know any better, some are simply cheapskates. Others use consumer-grade equipment that is known for unreliable handling of tapes. And that leads to destroyed tapes. Every video format suffers from inherent flaws. VHS tapes, for example, have excessive problems with grain, color shifting (chroma offset), and chroma noise (shimmering blue/red mists). Alignment is also a common issue, but can be mitigated or fixed with tracking or a VCR mechanical tweak. 8mm-based tape formats can have irrecoverable alignment (“tracking”) issues. Betamax and U-matic tapes can be victims of age and brand-specific recording methods. DV can be compounded by digital flaws, in addition to standard tape flaws. There are even issues within the formats that can cause major headaches. For example, tape quality variations that affect image quality. 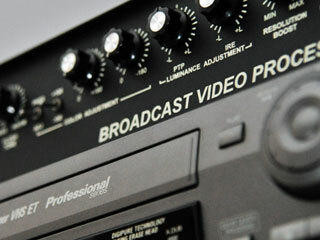 While JVC, TDK and BASF VHS tapes are generally perfect in most areas, brands like Fuji are grainy, which affects how much noise reduction must be used at capture time or during post-process. Some tapes were simply built poorly, like Memorex, and are known to snap off their reels if rewound too quickly (another flaw of consumer VCRs). Professionals should be addressing these problems, and compensating for them (if possible), to acquire the best possible video and audio quality, before forever committing it to a digital signal. Many errors are uncorrectable once digitized. Most hobbyists create DVDs that are full of hazy chroma noise, hissing/whining audio, and tend to actually look worse than the source tape. Such work should never be passed off as “professional”, but it happens all the time when amateurs foolishly choose to open video services. Had these service personnel been educated or trained in video, such a shoddy product would never be delivered to the now-disappointed client. The only time clients are pleased with such work is when they suffer the same low-quality expectations. And due to having dealt with a sloppy transfer service, they’ll never know how good their videos could have looked. But beware, as not all clients are this naive! They know amateur work when they see it. You’re not a professional if you cannot perform professional quality work. And in order to perform work to a professional level, you need the proper education, knowledge, experience and tools. Low-end devices and knowledge gleamed from Google searches just does not suffice. Answer the Question! How Do I Get a Job in Video? In order to work in the video post/transfer industry, you’ll need to prove your advanced knowledge of video to a potential employer. Using a TiVo, DVD recorder or capture card to record your favorite TV shows is not going to suffice. Neither will experience transferring your old home movies with some cheap doodad bought from Amazon.com, Best Buy, Walmart, Office Max or Office Depot. It’s just not the same.